HELSINKI, FINLAND--(Marketwire - March 9, 2011) - Comptel Corporation (NASDAQ OMX Helsinki: CTL1V), the leading vendor of dynamic Operations Support System (OSS) software, today announced that Comptel Control and Charge has been selected as a 2011 World Vendor Awards finalist in the Best Software Solution category. Comptel's solution was recognised for its proven ability to help operators worldwide respond to the rapidly-changing communications environment and optimize the quality of the customer experience within the constraints of their service networks. The World Vendor Awards, organized by Total Telecom, recognises the excellence amongst companies supplying hardware, software and services to the global telecom industry. This year's winners will be announced at a gala dinner on 5 May in London. 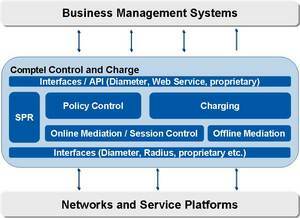 Comptel Control and Charge is an integrated, modular solution that brings together Comptel's existing, proven solutions for policy control and charging on a single platform. With the OSS solution, communication service providers can balance raising customer satisfaction, increasing the amount they are willing to spend, and managing scarce resources and capacity. Comptel Control and Charge has been deployed in major markets worldwide. The solution enables operators to take charge of their services -- and maximize revenue while controlling costs -- in a number of ways, including RAN congestion control, roaming cost control and enhanced subscriber awareness. This is the second consecutive year Comptel has been a finalist in the World Vendor Awards. The company's Comptel Dynamic OSS was named Best Support System in May 2010. Comptel was given this achievement for its product innovation, ease of use and applications of the software suite, and customer satisfaction. "It is an honour to be recognised two years in a row by the World Vendor Awards," said Ms. Arnhild Schia, senior vice president, strategic marketing, Comptel. "Whether it be used for RAN congestion control, service differentiation or another application, Comptel Control and Charge has demonstrated its versatility and ability to help communications service providers dynamically manage and monetize the latest broadband services. We believe that our solution will become even more critical for operators with the move to 4G and LTE." For more information about Comptel, visit www.comptel.com. Comptel and its OSS solutions have received many industry awards. Connect with Comptel on its blog, The Dynamics of OSS, Twitter, LinkedIn and Facebook. Also visit the company's YouTube channel.